Apple has sold over one million iPhone 3Gs in first weekend. iPhone 3G looks stunning and runs a lot faster. I am sure most of us would like to have one too. Have you got yours yet? Have you ever think of developing an iPhone Application / iPhone Web App for it? However, how can we get started? Where can we get all the best iPhone Application development resources? 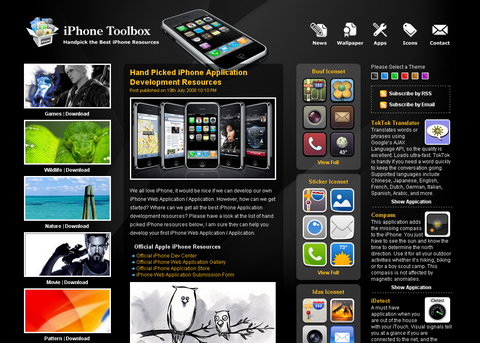 You should take a look at the article: Hand Picked iPhone Application Development Resources by iPhone Toolbox. If you have an iPhone, you can download free iPhone Wallpapers, iPhone Icons from iPhone Toolbox. Also, you can check out the iPhone news and hand picked iPhone Web Apps as well. Thanks for the free guide, i’ll attempt to build an app, lets hope I don’t break something. so be it .. here I have begun on my first iphone web-app and this very page was the first place that inspirited me. Here I came again to drop this note after I completed my ‘tour’ on Apple development site, just having ourselves accepted there.